What does it look like to have conversations about race that acknowledge and center the fact that the U.S. was built on a foundation of genocide, antiblackness, and white supremacy, and find ways to validate and incorporate the experiences of those of us who occupy the many spaces between the categories around which we have oriented our research, our vocabulary, our world? These are the questions I am working to answer for myself -- a biracial educator, who is often perceived to be white and has a white partner -- and as a mother to three strong, biracial girls. Roosevelt Island, Minnehanonck to the Lenape who were indigenous to the land; renamed Hogs Island by the Dutch who “purchased” the Island from the Lenape, history’s white-washing of settler colonialism; renamed Blackwell’s island for Robert Blackwell, the son of English colonizers who ousted the Dutch; renamed Welfare Island, housing hospitals and a prison until it was leased from the city for residential use in the late 1960s; and finally, named for FDR in 1973, eight years before my parents moved there. A floating wedge between Manhattan and Queens around which barges and tourist boats, and the occasional brave kayaker, must navigate. It is rapidly gentrifying, and yet its lower- and middle-income roots can still be glimpsed, reflected in the glare off the new construction. The story of my Island, that of being both and neither simultaneously, is the story of my life. 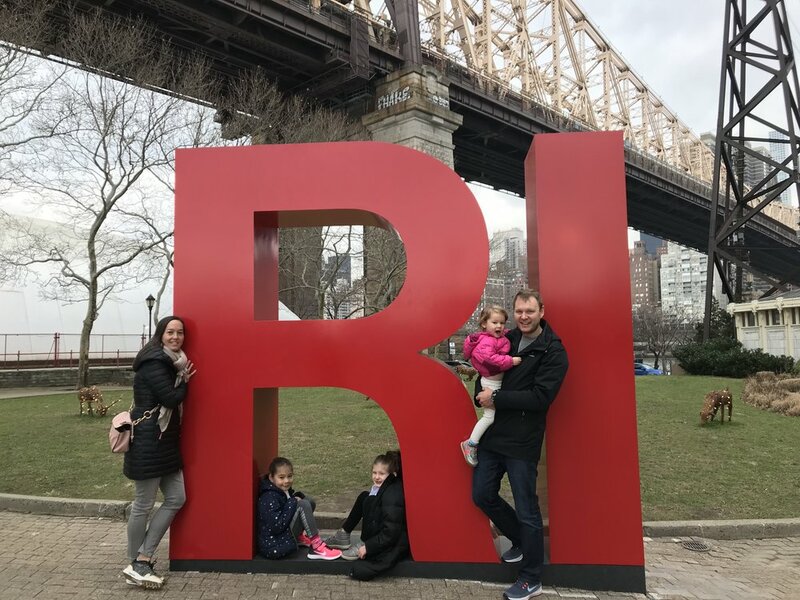 The author and her family on Roosevelt Island. I am from my mother’s womb, in which my head grew so large that it was unable to come out of her small pelvis. Even before I was out in the world, I was already somehow not of her. I grew too large for her to contain, so much so that a white male doctor had to slice me out of her to save us both. An act that violates one body to rescue another; destroys as it saves. I am of this woman who endured so much to be here in this country, and the man who is the reason she moved away from her homeland for good. My mother, who will tell anyone who listens that I ruined her abs forever, while my father and his father watched the Superbowl in the hospital waiting room. I have been asked this questions so many times I’ve lost count, both in the U.S. and while traveling. I agree that it can be unsettling and often signals that I am being othered by the majortized group – I’m not Chinese while living in Hong Kong; I’m not “full Japanese” when visiting my family in Tokyo; in the U.S. I’m too Asian to be white, too white to be Asian American. Not white enough, not Asian enough, I am not enough. The message, whether intended or not, is clear. The asker may want to make it clear that I don’t belong, or has been socialized to perceive nonwhiteness as outside of the normative group. Boy: Are you Sheila’s mom? Boy: Are you Jade’s mom? Boy: Whose mom are you? The boy has named almost all of the Asian moms at the preschool – there are only so many of us – as he scrolled through his questions. Afterwards, I text my friends (Shelia’s mom among them) and we have a good laugh, while also collectively shaking our heads. What I don’t admit to them in that moment, however, is that this blonde-haired, blue-eyed boy, who plays hockey like his dad and whose mom loves to throw catered parties in their multimillion dollar home, has given me a gift. Has made me feel seen in a way that none of the self-proclaimed progressive, white women who proliferate the halls of the preschool and my social circles has. If we agree that colorblindness is harmful, then what does it mean if we lump this little boy under the umbrella of “microagressor”? What he was really doing, in a developmentally appropriate way, was letting me know that he does see “color.” That he didn’t have the tools to do that in a way that was potentially less harmful is a topic for further exploration. Where the adults in his life come in are also important piece of the puzzle. My interaction with the boy differs in some ways from the proliferation of “No, where are you really from”s that preceded it. Are these questions coming from a place of intentional otherizing? Sometimes. Are they coming from a place of noticing and wanting to engage and learn more? If I am to continue the work of breaking down the binaries that surround us, I have to believe this is also true too. Simultaneity. I mean… where is your family from originally? From a two-story house once at the border of a bamboo field that is now a neighborhood of apartment complexes. From my grandmother, Oba, who met my youngest daughter for the first and last time one hot, Tokyo summer and who breathed her last breath at the age of 102. From my mother, born in the waning years of World War II, raised alongside her two sisters during U.S. occupation and food rations, who grew up to become a professional ballerina. From a family of strong women, to birthing three daughters of my own, always feeling like I don’t quite belong, and learning to draw strength from it every day. I am often advised that I should leverage my identity as a white-presenting person of color (translation, one who is “more palatable” to white audiences) to my advantage as a facilitator of conversations around equity, inclusion, and antiracism. And while I must continue to deeply interrogate the privileges that come with my white skin, I am also starting to push back on the notion of white-presenting-ness as something that is absolute. Just as I will encourage someone who says to me, “All people of [insert race] look the same” to do better, or tell myself when I stay quiet instead of naming racialized dynamics that I see unfolding to do better, I will ask those who seek to immediately categorize when they look at me, to do better. I know that many people see me, and like that little boy, see me. Therefore, the inability to do so, or the desire to put me into a monoracial box, must be interrogated as well. Must be named for the white supremacy culture that it too, is. That author as a child in Japan. Anri Wheeler is a writer, runner, and mother to three strong daughters. She is a New Yorker currently living in Cambridge, MA where she is an educator focused on helping organizations and individuals better understand the systemic roots of oppression and bias.